‘Northern California where the girls are warm’ sang the Steve Miller Band in their famous hit Rock’n Me. While we couldn’t possibly comment on the (rather fetching) ladies of the region, we can give you the complete picture on the superlative golfing vacations on offer. In the space of a dozen days we follow incredible coastal roads and head off the beaten track to play a score of courses all with their own allure and idiosyncrasies. The weather is usually great, the views are often sublime, and the hospitality is something else. Our biggest challenge on the fairways? Trying not to smile. Northern California has some of the most acclaimed golf courses in the world – Pebble Beach, Cypress Point, Olympic Club and Spanish Bay to name just a few. Here I take a look at the hidden gems in this spectacular region of the United States – and believe me there are some great tracks out here offering Pacific Ocean links golf, parkland golf, TPC golf and courses that are so far off the beaten track they supply ‘Caddyshacks’ and cabins for you to stay overnight, with BBQ areas thrown in for good measure. Of course there is so much else to see and do in Northern California that you may not want to take on the 20 courses in twelve days like I did. You could play 18 holes in the morning then hit the wine-tasting trails of Sonoma and Napa, or sample the delights of Monterey and its Aquarium and embark on some truly stunning drives. Rent out one of the beautifully appointed houses on the fairways of Greenhorn or Saddle Creeks, or if you’re in a group of eight or more check out the Caddyshack and Cabins at Greenhorn Creek and Stevinson Ranch. 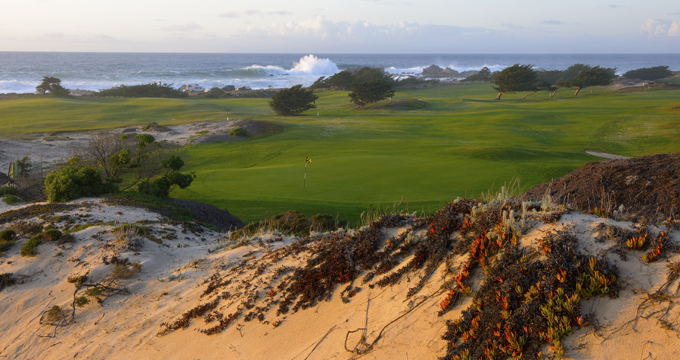 Or you can stay in a hotel right on the beach with its own spa while you play the sensational course of Monterey. The choice is yours – and what a choice. Golf in California is for everyone: groups on tour, couples wanting to hit the wine trail as well as the golf trail, or simply single golfers. No need to play a course by yourself here unless you want to. They pair everyone up, and like me you’ll meet some great people – from fire-fighters in San Francisco to pool guys in Monterey, a doctor from Canada or a Japanese couple on a golfing holiday. It’s all out here for you, so get those bags and clubs packed. You’re in for a journey of a lifetime.